Who is a credit to his Catholic school? No stage fright for Ryan Elkins. 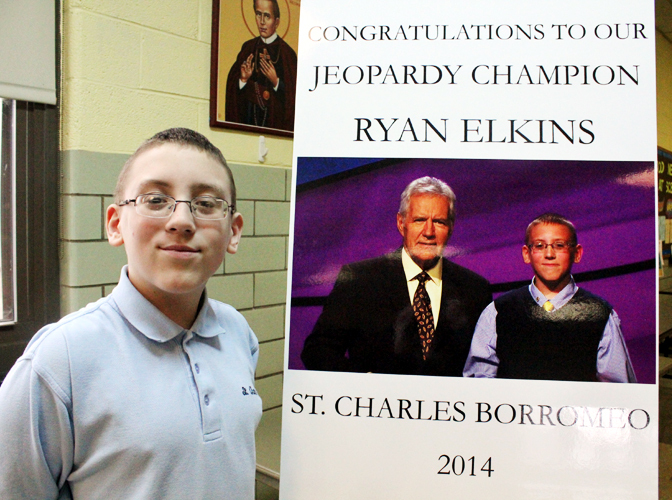 With months of studying behind him, plenty of prayers from the students and faculty of St. Charles Borromeo School in Bensalem and a Blessed Mother pin on his collar, he stole the show on Jeopardy Kids Week, and came away with $17,100. 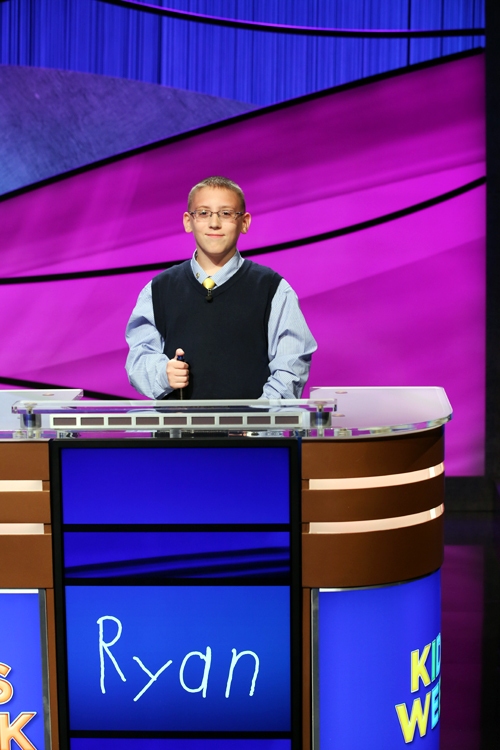 The 13-year-old seventh grader was chosen among thousands of kids across the country who last summer began filling out online applications to compete against two other contestants for the Jeopardy jackpot. He admits to being a little nervous when he first faced the camera, but in no time, his determination to prevail took over. “I realized I had to stop thinking about the audience and concentrate on the game board, (show host) Alex Trebec, and the answers,” said Ryan, whose poise belies his youth. The kids who participated had undergone several tests and two auditions. They beat out 15,000 other young hopefuls from around the country. Ryan may have had the jump on the others because, he said, regular Jeopardy is his favorite show. Add to that the half-hour every day Ryan poured over almanacs, sports information, history, pop culture and geography topics. Ryan’s response when Trebec asked Ryan about his future plans was a real showstopper. By the end of the show, which was taped in October and aired in November, Ryan knew he was ahead so he only bet $100 of his stash on Final Jeopardy. He ran away with the prize when correctly responding, “the Queen of England” to the clue about which monarch reins over 16 countries, including Jamaica and New Zealand. The real challenge was keeping his victory a secret because the show was taped in October and would not be aired until December, when Ryan got to see the surprise on the faces of 200 people gathered in the auditorium of St. Charles Borromeo School to watch the show on a big-screen TV. Ryan’s mother Erica said it was really tough to keep Ryan’s win a secret for two months. “We could only tell close family members; we couldn’t even tell Sister,” she said. Sister James Eileen, I.H.M., said the Immaculate Heart Sisters who help staff the school prayed on the day the show was filmed. “We gave him a medal to wear and told him that, if he couldn’t wear it on his collar, just pin it under his collar. But when we saw him, he had the medal on the outside. We were just so proud of Ryan,” she said. Ryan said his winnings went into his bank account to be used for college. Meanwhile, while not studying, he passes the time reading mostly science fiction and fantasy stories, and playing video games. But he has one more goal. “I’d like to go on Jeopardy again,” he said.